Determine the flow rate and pressure at the point in the air system where the filter is to be installed. 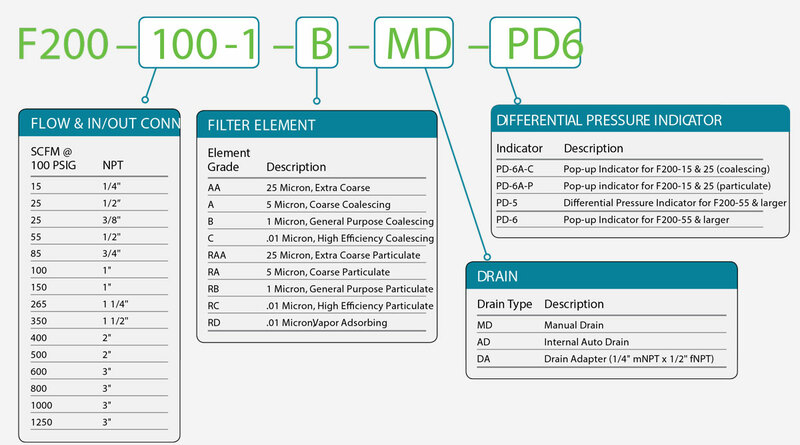 Choose the filter element letter grade that meets the purity level required by the application. Select a differential pressure indicator. Rugged housings and long-lasting elements give you the best value for your money. They’ll provide dependable filtration to reduce your downtime, maintenance and operating costs. 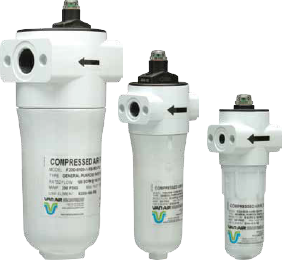 Compressed air is a vital utility in many industries. Yet contamination plagues many air systems. Compressor lubricants and oil aerosols. Dust. Dirt. Scale. These damaging contaminants lead to lost productivity and increased down time. It doesn’t have to be this way. Turn to F200 Series filters. The toughest most reliable industrial filters for compressed air and other gases. 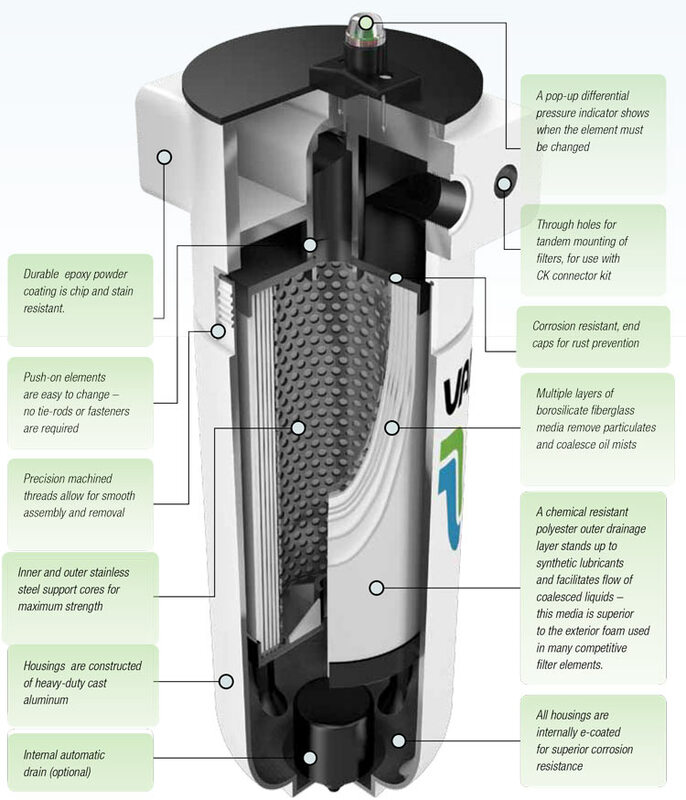 Each F200 filter includes a rugged cast aluminum housing and a filter element constructed with stainless steel support cores and high performance filter media. A filter element comes pre-installed in every housing. 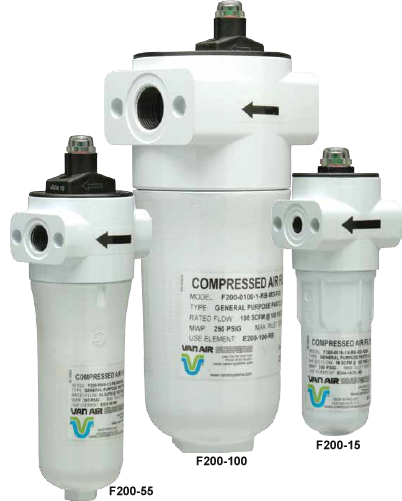 Van Air Systems’ filter elements are easy to install. Simply push the element into place for a snug fit. Unlike competitive filters, F200 filters use no awkward tie rods or fasteners. Simple operation is key. Compressed air or gas enters the inlet side of the head and passes through the single filter element. In oil removal applications, air or gas flows from the inside to the outside of the element. In particulate removal applications the flow pattern is from the outside of the element to the inside. Clean air or gas exits the opposite side of the head. The F200 Series includes housings with connection sizes from ¼” to 3” NPT for flow rates from 15 to 1250 SCFM (at 100 PSIG) and nine filtration grades to meet your exact system requirements. 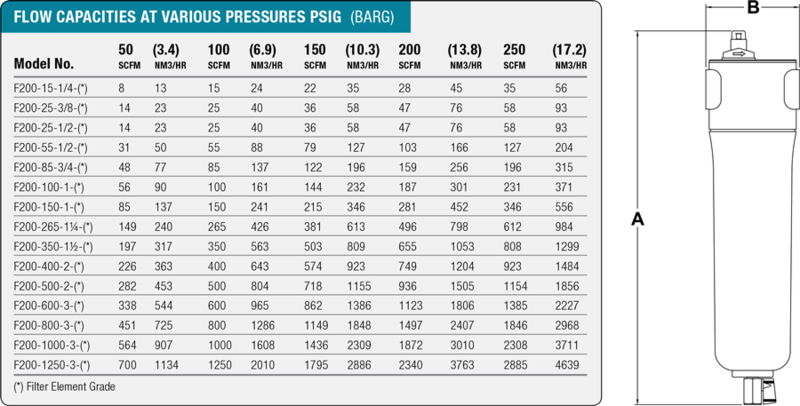 All F200 series filters have a maximum working pressure of 250 PSIG. F200 filters are approved for the use with both compressed air and hydrocarbon gases. Strength and durability matter. 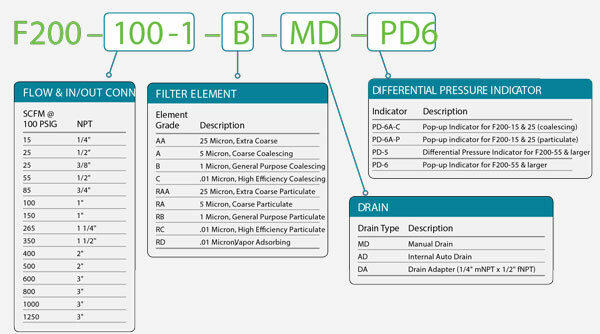 That’s why every F200 filter is designed and constructed with the industrial compressed air user in mind.